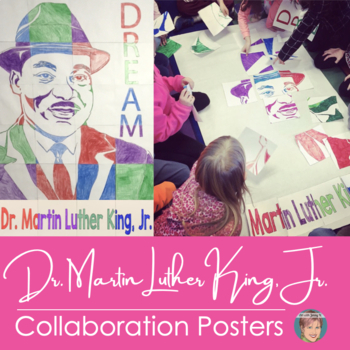 Martin Luther King Jr. Collaborative Classroom Poster: This is a great, inclusive, community building, Martin Luther King Day activity. Appropriate for Black History Month or any unit or lesson on Dr. Martin Luther King Jr. This product contains two methods for making a classroom MLK poster. One a bit more challenging that the other--great for differentiation! I also include a bonus "unscramble the drawing worksheet" to add to this lesson. I have included both options--you decide what works best for your class. Preview this short VIDEO to get a sense of this project. This poster is included in my Black History Month Bundle. These art activities are intended to complement/supplement any Martin Luther King Day or Black History Month unit you teach. It’s a great way to start up a unit or to cap one off. 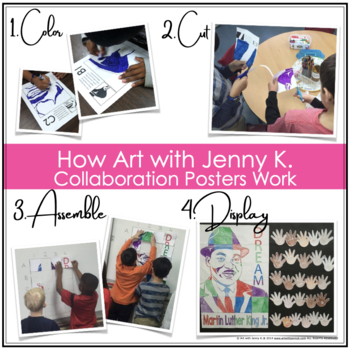 These art activities are an engaging and entertaining way for students to work together to create a large poster of Martin Luther King Jr. that makes a great classroom focal point! ~Use pieces A1-E4 for 20 pieces- yielding a final poster approx. 28”x 35"
Lesson #1 Martin Luther King Jr. Classroom Collaboration Poster Great for Elementary students. This lesson is very easy for teachers. Each student is given one section of a large mosaic poster to color in according to the instructions on each sheet. This lesson is not hard but is more challenging than the coloring version in Lesson #1 and that is to create an appropriate lesson for older students, art teachers or students who want to take this poster a step further. In this lesson, each student will actually draw their own grid piece using a small version of their assigned gridcell as a reference. Once the pieces are drawn and cut out, the classroom poster can be assembled. 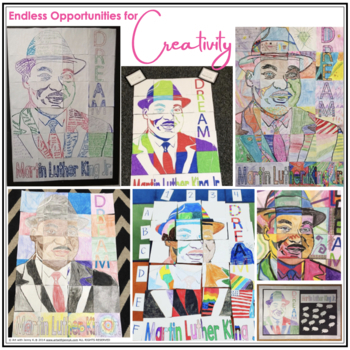 This lesson engenders a lot of cooperation among students to get all of the drawings within the individual gridcells to line up well and to produce a nice looking final poster of Dr. King that teaches students that ever single student is important in collaboration. The results from both posters are stunning!! This handout is great because it allows students to each walk away with their own drawing of Dr. Martin Luther King Jr. It also allows students to work on a smaller, personal scale. It’s a great extension for when students finish their work early as it can be done independently. FREE Sample from Brain Waves Instruction Included in this poster is now a sample from Brain Waves Instruction to help you integrate art and English Language arts even more! You will find the free sample included in this resource. I highly recommend for grades 4-8 that you pair my poster with her full resource. You can view it HERE.